Hanoi (VNA) – There is plenty of room for Vietnam and Angola to expand cooperation, especially in the fields of agriculture, education, healthcare, and telecommunication, according to President Tran Dai Quang. The President made the remark at a reception for Angola’s Foreign Minister Georges Rebelo Pinto Chikoti in Hanoi on April 25. He urged the two countries to accelerate the implementation of projects and deploy specific measures to deepen the bilateral cooperation, including the increase of all-level delegation exchanges, especially among high-ranking officials. The bilateral trade is still modest, which hit 50.2 million USD in 2016, he said, proposing Angola facilitate the import of Vietnamese goods, prioritizing food, consumer products, and construction material, as well as promote exchanges among businesses and enable them to join trade fairs, exhibitions, and workshops. 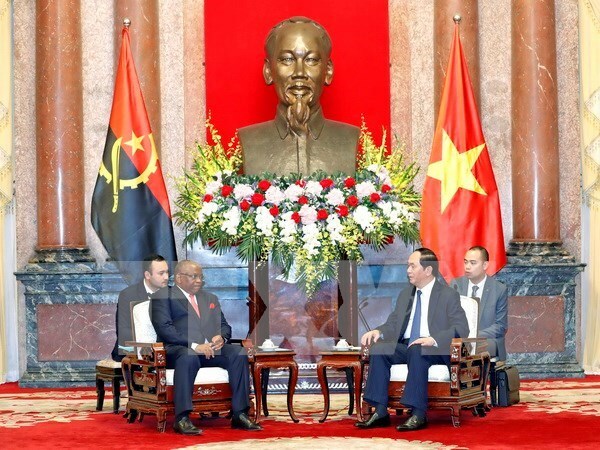 President Quang said the outcomes of the visit of the Angolan Foreign Minister and his talks with Vietnam’s Deputy Prime Minister and Foreign Minister Pham Binh Minh will create a boost for bilateral partnership. The Angolan Foreign Minister took this occasion to thank the Vietnamese State for dispatching experts to support Angola in education and healthcare. He said during his talks with Deputy Prime Minister and Foreign Minister Pham Binh Minh, the two sides agreed to establish the Vietnam-Angola Chamber of Commerce and Industry to enable businesses to negotiate investment cooperation projects. Angola will restart Vietnam’s wet rice cultivation project and realize bilateral collaboration opportunities in oil and gas, and telecommunication, the Minister said. He affirmed that Angola wants to become a reliable partner of Vietnam and pledges to support the country’s bid to become a non-permanent member of the United Nations Security Council in the 2020-2021 tenure.